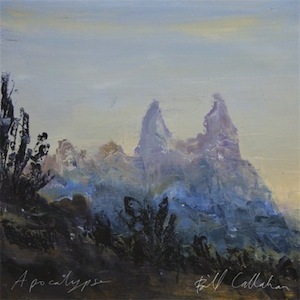 Apocalypse features the expected imagery and feelings of a Bill Callahan album: slower songs that send the listener reflecting in the quiet of fields, and more upbeat ones that feel fun and rugged. With the slow sweetness of the cherished “Let Me See The Colts” from the Smog days, “Riding for the Feeling” feels romantic and is a song filled with poignant lines of living in the moment. “America” has a cool blues, open mic feel to it while Callahan sings descriptions to and about America. The opening track, “Drover,” is the old soul’s anthem (and that’s what we Callahan fans mostly are). Over a South Western desert guitar setting, Callahan sings of hardships and admits, “Anything less would make me feel like I’m wasting my time.” Facing the troubling elements of this world and our lives is a reoccurring theme with our good man Bill, that they’re not just negatives or single incident items. That said, an apocalypse can be an ongoing event, good and bad. If Callahan’s low, strong voice and the stoic folk sound of his songs don’t keep you, the direct lyrics that setup controlled, yet expressive revelations and emotions can strike something in anyone.